If you attended the film, music and interactive festival South by Southwest (SXSW) in Austin, Texas over the past week, you may have seen them. Thirteen homeless men walking around wearing t-shirts that read, “I am a 4G hotspot.” It’s the brainchild of advertising agency Bartle Bogle Hegarty’s BBH Labs. These homeless men – um, I mean these “hotspots” — were intended to provide internet connectivity to smartphone users at the festival, where usage can often overwhelm cellular networks. They were paid $20 per day. Repeat, $20 PER DAY, not per hour. (BBH Labs suggested that festival goers using the service also pay these men $2 per 15 minutes of connectivity, as a donation). According to CBS News’s “TechTalk”, the human hotspots included a man named Clarence from New Orleans who lost his house to Hurricane Katrina, and Jeffrey from Pittsburgh who suffers from the after effects of a traumatic brain injury. 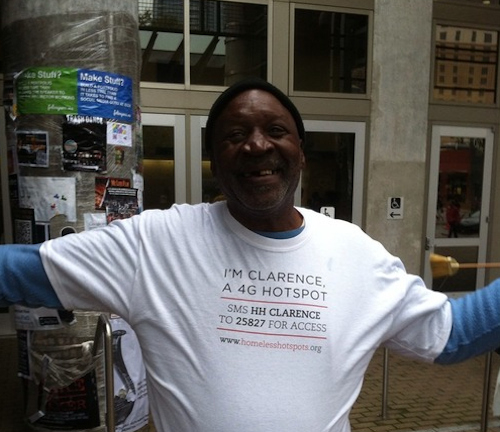 This feels very wrong to me, even if Clarence said he enjoyed the work because he “likes talking to people”. BBH Labs doesn’t see what all the fuss is about (and there has been plenty of fuss). Proponents argue that this is an employment opportunity. Wrong! An employment opportunity should pay at least minimum wage. Otherwise, it’s called exploitation. Would you hire a homeless person to spend the day mowing your lawn or washing your car, and only pay him $20… just because he’s so desperate he’ll accept it? I hope not. In response to criticism from bloggers, BBH Labs has compared human hot spotting to selling “Street News” and the like, but that’s wrong too. Street newspapers tend to cover topics relevant to the homeless community, and are largely staffed by homeless (or formerly homeless) people who do the writing and printing. When working at these newspapers, the homeless serve a human function and ideally learn a skill. Making homeless people wear a dehumanizing label, and stand around while a bunch of yuppies check in via Foursquare – after which those yuppies pitch in $2 — is troubling. If BBH Labs had a goal of generating free publicity, then this experiment has been a success. (No publicity is bad publicity, right?) But I sincerely hope this is the last any of us hears about human hot spotting.